Wigs and seals and tippets and chimeres: thus shall we be known! I have three clergy friends who are soon to move to new parishes, and have been preparing for their services of welcome. The ecclesiastical nomenclature of these services is complex: one friend is having a collation and induction, another a licensing and installation, and the third an institution and induction. As I am a college chaplain, it has been a while since I have had these done to me, but, as a patron’s representative, I have been involved in a fair few of these services in recent years. The service of welcome for a new vicar, rector or what-have-you is a fairly recent phenomenon, growing to near universal popularity through the 20th century. Before we did public ceremonies, these were fairly private acts of canon law. The twofold naming — an X and Y — is down to the separate admission of the candidate to the spiritualities and temporalities of the benefice. The spiritualities include the responsibility to perform divine service, occasional offices, preach, teach and hold the cure of souls (pastoral care). As the diocesan bishop is chief pastor of the diocese, admission to the spiritualities is given by them or their commissary (often an area, suffragan or assistant bishop, but can be any cleric). The temporalities are the actual legal possession of the benefice as property. In the past this would mean tithes, fees and glebe, but is now a more limited right to manage the property and control the benefice. Nowadays there are many more posts that are ‘incumbent status’ rather than actual incumbencies, usually attracting the name Priest in Charge or Team Vicar, which are exercised by licence rather than right, and the legal possession of the temporalities is lacking. There are three terms used to describe the handing over of the spiritualities of a benefice: licensing, institution and collation. All beneficed clergy are licensed to their cure of souls, but the term ‘licensing‘ is properly used for the formal admission of Priests in Charge, Team Vicars and others of ‘incumbent status’. The bishop or their commissary grants the spiritualities in a licence that sets out their responsibilities and the limitation to their term. Many Vicars or Rectors who are actual incumbents will instead receive a Deed of Institution, which is effectively the same as a licence, but unlimited in term. Here is the complicated bit! The patron or patrons of the benefice are given permission to present the chosen candidate to the benefice, the bishop then admits the candidate to the benefice and institutes them. Thus, institution is the final step in this ruritanian appointments process over which the bishop has two vetoes: they may veto the patron or patrons’ choice of candidate, and they may refuse to admit (although it is unlawful for a bishop to veto Crown presentations, they may still refuse to admit the candidate). The admission is technically the bishop’s right to examine the candidate before institution (patrons can appeal against a bishop refusing to admit a candidate, and the legal process differs depending on whether or not the bishop cites doctrinal grounds for refusing to admit). If the patron or patrons fail to present a candidate (it used to be within 6 months of vacancy of benefice, but that cannot surely still hold true), the bishop then has the right to collate a candidate, then that right goes to the archbishop if the benefice is still vacant, and ultimately to the Crown. With our modern system of job interviews, the interview panel, which often includes the patron or patrons, makes a decision to nominate a particular candidate, and the patronal presentation and episcopal admission are expected to follow suit. Wherever the bishop is sole patron, rather than presenting to themselves, the system is streamlined into what is called a collation, which merges the presentation, admission and institution into one. If the bishop is one patron among others, the full process has to take place. It used to be the case that all licensing, institutions and collations happened at the bishop’s chapel or wherever the bishop happened to be. As we have so many bishops today, a bishop comes to the parish church to do these things. If a patron is at the service, they will make a ceremonial presentation. Then the candidate will make oaths and declarations, to which the bishop or commissary will assent to admit them. Then the candidate kneels before the seated bishop or commissary, who reads the licence or deed of institution or collation over them, while the candidate holds the seal attached to it. How many rings of the bell is enough? The admission to the temporalities is quite simple after all of that. If one is instituted or collated, the temporalitites are given in the form of an induction. If one is merely licensed, then there are no associated legal property rights. The term ‘installation‘ is used to describe the purely symbolic act of placing a new pastor in their stall, and is used to fill the position where an induction would otherwise happen. Even then, some ceremonies are described as ‘institution, induction and installation’, even though the latter can be seen as a non-essential part of any induction. The bishop issues a mandate of induction usually to the archdeacon to induct the candidate that they have instituted or collated. Often the rural or area dean receives the mandate instead of the archdeacon, if the latter is unavailable, and some dioceses have ancient rights about who may induct whom. The core of the induction is an act of property transfer, a business deal, which is carried out by the mediaeval practice of the livery of seisin: the property is transferred by passing it, or an object representing it, from the hand of the giver to the hand of the receiver in front of witnesses. At its minimum, this means that the archdeacon or some other places the candidate’s hand on the latch of the church door or the key in the lock while the churchwardens witness. Induction, therefore, has to happen at the church (and only one church is necessary in multi-parish benefices, as the property is legally bundled together so that possession of a symbolic part is possession of the whole), and induction actually happens outside of the church, at the door, whence the incumbent is inducted into the building. The induction has accrued a number of other symbolic actions. The archdeacon’s dainty taking of the incumbent’s hand on a step dance around the interior of the church is a most delightful custom. 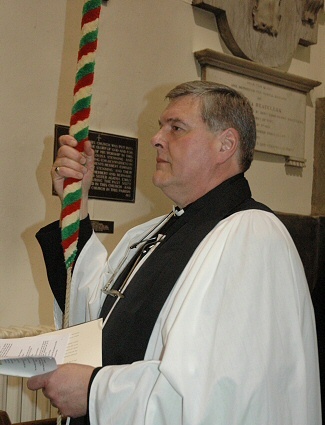 The new incumbent’s tolling of the church bell was originally to inform the parishioners habemus vicarium (‘the vicar’s here’), as they were not present at the church for the induction. All sorts of superstitions are associated with this tolling, thinking it indicates how vigorous the incumbent will be in mission or for how long they will stay. Lancelot Andrewes had the tradition of getting new incumbents to write on the back of their mandate of induction the following: accepi clavem, intravi solus, oravi, tetigi sacra, pulsavi campanas — ‘I received the key, I entered alone, I prayed, I touched the sacred things, I tolled the bells’. I do find something romantic in this practice of the new incumbent going alone into the church to pray, touch and toll. It is unclear precisely what is meant by tetigi sacra, whether it is the touching of the consecration points of the church, or the more likely touching of the font and altar, symbolizing sacramental responsibility. However this tangendum (‘touchy feely’) is the origin of the archidiaconal waltz and the crackerjack game of seeing how many baptismal ewers, chalices and Bibles the new incumbent can hold, symbolic of the pressures of ordained ministry, to which the addition of the rite of installation, taking of one’s seat, must come as a relief. When most parishioners took no part in these ceremonies, the reading in of the new incumbent on the first Sunday (or at least within a certain fixed period) was the point at which they received their pastor. This is the formal reading of declarations, and I think at one time included the incumbent’s recitation of the 39 Articles to prove how legit they were. While a much curtailed reading in still occurs, it is a hangover from the time when all the other things were done semi-privately. The practice of the new incumbent giving notices, which include a declaration of the next Sunday’s times of service, at the end of their service of welcome appears to be a descendent of promising the archdeacon or rural dean that they will read themselves in on the Sunday. Categories: Anglicanism, liturgy | Tags: 39 Articles, admission, Anglican, Anglicanism, archbishop, archdeacon, area dean, bell, benefice, Bishop, ceremony, church, Church of England, churchwarden, clergy, collate, collation, commissary, crown, cure of souls, dean, Diocese, door, ecclesiology, fees, glebe, incumbent, induct, induction, install, installation, institute, institution, key, Lancelot Andrewes, licence, license, licensing, livery of seisin, parish, pastor, patron, presentation, priest, priest in charge, reading in, rector, rural dean, seisin, service, spiritualities, temporalities, tithes, toll, vacancy, vacant, vicar, welcome | Permalink.